In this guest blog, Sabrina Mahtani, co-founder of the Sierra Leonean NGO, AdvocAid, writes about a woman who was sentenced to death in 2010 when she was 17 for killing her abusive former boyfriend. Her sentence was commuted to life imprisonment in 2011 and although her appeal was heard in 2014 – 2015 she has still not received a decision in her case. Sabrina explains why the law is ill-adapted to such cases, resulting in unjust outcomes. Aminata* was only 17 years old when she was arrested for killing her former boyfriend. This was eight years ago, and soon after in November 2010, she was sentenced to death for murder and feared each day she would be executed before her sentence was commuted to life imprisonment by the government on Sierra Leone’s 50th Independence Day on 27 April 2011. A local NGO, AdvocAid, filed an appeal for her in 2010 but Aminata is still waiting for her appeal judgment almost 7 years later. She, like many women behind bars, are often forgotten and overlooked. Aminata is from the Eastern region of Sierra Leone, Kenema, rich in diamonds. She is an orphan, is illiterate and did not go to school. Aminata was in a relationship with Foday* but left him as he used to beat her on a regular basis. Unfortunately, Foday lived in the same compound as Aminata as he was the landlord’s son and he used to harass her to continue the relationship. One morning in September 2009 it all got too much for Aminata. Foday was beating her with a rubber pipe and she stabbed him with a knife to protect herself. She was arrested by the police and detained for several days. AdvocAid hired a senior female lawyer to represent Aminata in court. She argued at the jury trial that Aminata acted in self-defence and was not guilty of murder. However, the Judge did not agree and, when advising the jury on the law, he stated that using a knife when being beaten by a rubber pipe was disproportionate use of force. At 17 years old, Aminata was a juvenile and should not have been sentenced to death in the first place. However, like many people in Sierra Leone, she did not have a birth certificate to prove her age and so the police listed her age as 18. AdvocAid met Foday’s brother in 2013. He stated (on film) that his brother used to severely beat Aminata and he felt bad she was spending her life in prison when she was a victim of abuse. After her conviction, Aminata was moved to the maximum security prison in the capital Freetown, about 5 hours drive away. She has no contact with family or friends and her physical and mental health is deteriorating as she loses hope that she will ever leave prison. She sometimes attends education classes offered in the prison by AdvocAid and engages in bead making but most days she is quiet and tearful. Sadly Aminata’s story is not uncommon and AdvocAid has encountered similar cases in its 10 years of providing access to justice to women. The number of women in Sierra Leone and globally who have committed violent crimes is small. However, where women are convicted of murder or manslaughter, in a significant number of cases the victim is a male family member and there is a history of domestic violence. However, many justice systems do not take into account the trauma experienced by these women. In Sierra Leone, and many other countries, there is no legal provision for a history of abuse to be considered and women have to rely on existing defences, such as self-defence, which are not suitable to women who have experienced prolonged abuse. ‘Self-defence’ requires the act to be in response to an imminent threat, thus excluding many cases where women fatally attack their abuser. The psychological state (termed by experts as ‘battered woman syndrome’ or ‘slow burn reaction’) of women who have experienced years abuse means that they often do not, and cannot, react immediately, and are therefore unable to rely on this defence. Further, courts often do not have the right guidance or training about how to take victimisation into account when determining guilt or the length of sentence. States have obligations to protect women from domestic violence. Sierra Leone’s Domestic Violence Act is a progressive law but there are challenges with enforcement and cultural and socio-economic challenges for women to report abuse, particularly when many women are still reliant on men for financial support. Aminata’s case was finally heard in the Court of Appeal in May 2014 and the case closed for judgment in February 2015. However, to date no judgment has been given. Sierra Leone’s judicial system is under-resourced and many Supreme Court and Court of Appeal judges also sit on High Court cases. Almost 2 years later, Aminata is still waiting to hear whether she can walk free or whether she will have to spend the rest of her life in prison. Advocaid is a NGO in Sierra Leone that works with girls and women caught up in Sierra Leone’s unjust legal system. 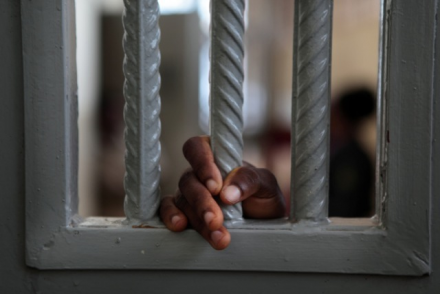 They are the only organisation in West Africa providing holistic access to justice via free legal representation, education empowerment, detainee support and a moving forward programme, ensuring detainees leave as stronger women with brighter prospects. Find out more or donate to support AdvocAid’s work. In 2016, PRI and Linklaters LLP published a multi-country study, Women who kill in response to domestic violence: How do criminal justice systems respond? The report examines criminal justice responses to cases where women have killed their abusers. The findings showed that with few exceptions, criminal justice systems are failing these women by ignoring their trauma and realities/dynamics of domestic violence. In almost all jurisdictions covered, there is no separate basis in law for a history of abuse to be considered and generally, women have to rely on existing legal defences (eg. self-defence, provocation, or temporary insanity). These typical defences tend to be ill-adapted to women who have experienced prolonged abuse. Courts are not equipped with the right guidance, or show a reluctance, to take victimisation consistently into account as a factor either in establishing culpability or in sentencing. Some promising practices have developed in a few jurisdictions researched (eg. a number of Australian and US states), establishing defences or partial defences for abuse cases, or enabling greater weight to the mitigating circumstance of domestic violence to be given when establishing culpability or in sentencing. Download the report or read a blog on this issue. Sabrina Mahtani is a British-Zambian lawyer who has worked in Sierra Leone for several years on various human rights projects. She is the co-founder of AdvocAid and currently works for Amnesty International as their West Africa researcher. This article is written in a personal capacity.